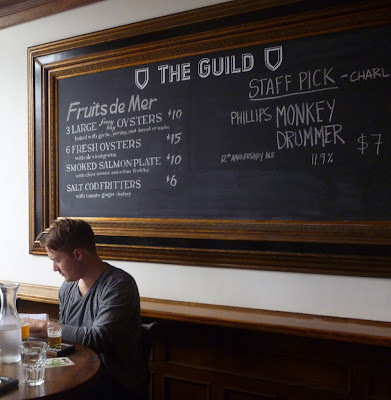 Last night we dropped by The Guild Freehouse at 1250 Wharf Street. This relatively new restaurant touts “the finest selected English, Irish and American Provisions” and indeed they do. They have an impressive selection of “ales and such” as well as lagers and dark beers. The Guild Freehouse showcases the best of craft and micro-brewed beer from the Pacific Northwest region. They have 12 tap beers and up to 40 choices in the bottle. Now that’s selection! The Guild is a more than just another concept restaurant. Like the actual meaning of the word "guild" it represents a reclaiming of the idea that people who work together and share common values can create something that is stronger than what any one person can do alone. The food is distinctly common (in their words), but exhibits true craftsmanship, care and value. The Guild takes pride in associating with local producers and using the kitchen as a gateway for their products. There is a good choice of menu items. We particularly enjoyed the Salt Cod Fritters, Fish and Chips with mushy peas, and Cumberland sausage with buttermilk mash and gravy. We were treated to some items unique to this restaurant such as Scotch Eggs and Bacon in a Glass. Now Bacon in a Glass, well bacon pretty near anywhere, is music to a man’s ear! What a novel idea. Yes that is exactly what it is, a beer glass filled with delicious strips of glazed bacon! 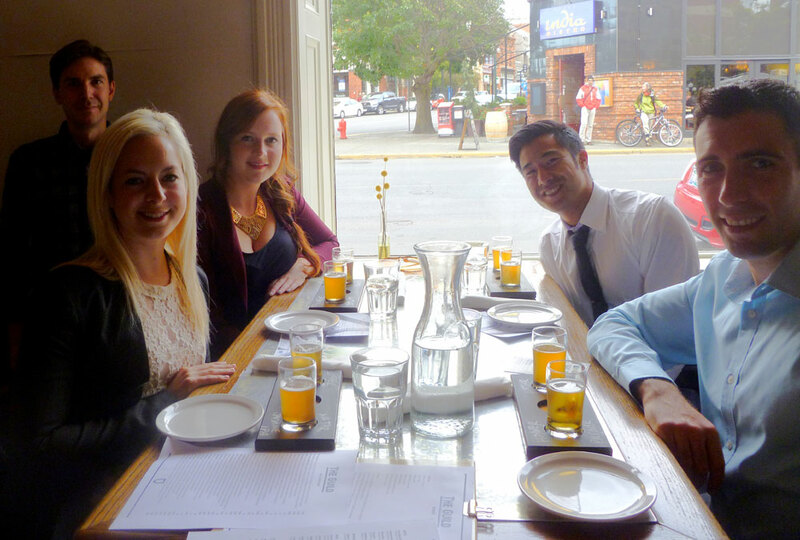 We were also treated to a beer taster consisting of two delightful beers, Hoyne Pilsner and Avatar Jasmine IPA. Linda also enjoyed a glass of Phillips Monkey Drummer, an 11.9% alcohol brew! The atmosphere is comfortable with lots of warm wood, a British feel without being over the top. The servers are friendly, helpful, and knowlegible about their products and drinks. For sweets at the end of our taster feast, we were treated to little pots of creamy Lemon Posset and slices of Sticky Toffee Pudding, both delicious. Thanks to Matt, Heather, Mariam and chef/owner Sam Benedetto for an enjoyable evening and the opportunity to experience this wonderful new venue in Victoria. While we were there the restaurant seemed quite busy. We recommend that you give them a try and find out what many others have already discovered! You can see more pictures of this event at our Facebook page. I'm Glad to Visitor of this post ! Shaakespear by the Sea in Sidney - Don't Miss It!